"Sixteen-year-old Lex Bartleby has sucker-punched her last classmate. Fed up with her punkish, wild behavior, her parents ship her off to upstate New York to live with her Uncle Mort for the summer, hoping that a few months of dirty farm work will whip her back into shape. But Uncle Mort’s true occupation is much dirtier than that of shoveling manure. Yet her innate ability morphs into an unchecked desire for justice—or is it vengeance?—whenever she’s forced to Kill a murder victim, craving to stop the attackers before they can strike again. So when people start to die—that is, people who aren’t supposed to be dying, people who have committed grievous crimes against the innocent—Lex’s curiosity is piqued. Her obsession grows as the bodies pile up, and a troubling question begins to swirl through her mind: if she succeeds in tracking down the murderer, will she stop the carnage—or will she ditch Croak and join in?" 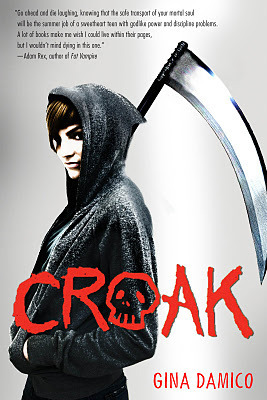 Firstly, I want to thank Gina Damico for coming up with something so fun and hilarious as Croak. I had such a great time reading this book and once you read it, you will know why! This world that Ms Damico has created, is truly amazing. Lexington was a good kid, who has just turned a bit sour. At least that's what her twin sister Concord believes. Now she is being shipped away to stay with her Uncle Mort, and what ensues is a fantastic adventure. There is nothing I didn't like about this book! The character names are so unique, I loved them all! Croak was such an amazing little town, I devoured all the descriptions, envisioning them for such a long time, until I realised I wanted to actually read the book! The Grim's and their world - the Ether, Lair and best of all, the Afterlife - were so excited, I found myself wishing that it was all real. I figured out who the killer was fairly early on, but even when they all found out, it was still a shocking and amazing all at once! Get your hands on this book, and enter the world of Croak!